Colocasia Gigantea (COMMON FORM!!) not to be confused with the Thailand giant form. 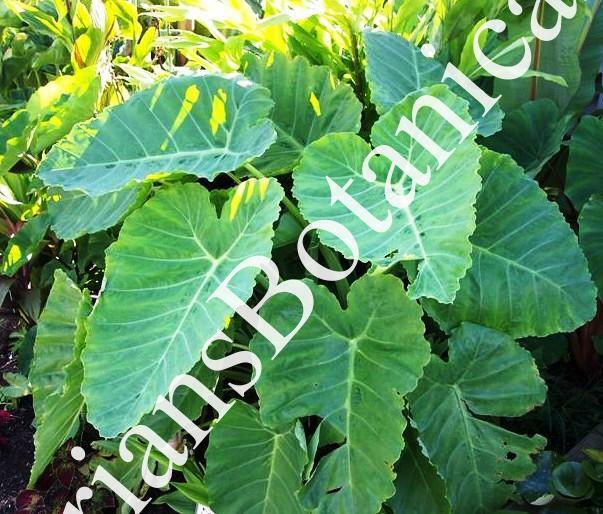 There are two Colocasia Gigantea clones that are considered by science to be the same species but they are distinctly different than one another in habit and growth. The one shown and noted above is commonly called Colocasia Gigantea (Thailand Strain) the other clone I commonly refer to as Colocasia Gigantea (Common Strain). This form was more widely known years ago and is more commonly used for food and production in tropical Asia. It has several key differences than that of the Thailand Strain. One difference is that it rarely reaches the same height and size of Thailand Strain. The largest Colocasia Gigantea (Common Strain) plant I have grown was 5 to 6 feet tall. The leaves are also smaller in size, 2 to 3 feet long and wide. One of the sure ways to tell the two plants apart is the odd growths under the foliage of the Colocasia Gigantea (Common strain). Under each mature leaf it has an odd mutation of what looks to be leaf like structures between the veins. I have also found that the Common Strain rarely flowers. I was able to get flowers 1 time by having the plant grown in hydroponic type environment. The flowers were identical to the Thailand Strain but smaller and did not produce pollen or fruit. Some other very notable differences is the small tubers produce by the Colocasia Gigantea (Common Strain). This plant produces multiple plants and is much more productive in producing tubers. This tuber production may also explain why this plant is much more cold tolerant than the Thailand Strain. I have over wintered the Common strain multiple times in the ground here in Kentucky with little to no protection. The same cannot be said for the Thailand Strain which seems to be hardy to zone 8 and higher. Colocasia Gigantea (Common Strain) has grown in aquatic or hydroponic environment without rotting. Heavily misted plants produced runners over the top of the soil this was not common for regular ground production. The plants are off the common clone and are bare rooted with foliage removed. These were once very available years ago but now seem to be more rare on the market.